"Petrels, Albatrosses & Storm-Petrels of North America: A Photographic Guide" by Steve N. G. Howell. It's summertime in New England, and that means, among many other things, that the local pelagic birding year is just about at its peak. We're fast approaching the northeast US's finest pelagic trip: the Brookline Bird Club's annual overnight canyon trip later this month. What an appropriate time to review Howell's long-awaited tubenose guide. Is it worth the price of purchase (List price $45)? You probably already know the answer to that, but I'll go through the formality of a review. The Introduction, at 49 pages long, might be worthy of being its own book (perhaps a booklet...or maybe a pamphlet, like "Acting without Acting"). Seriously, the intro is packed with tons of fascinating stuff. Howell starts with the definition of a "tubenose" and how various tubenose families differ. Their typical life cycle is described. The focus then switches to their main habitat: the ocean. Here we find an easy-to-understand piece on the major ocean currents and characteristics such as upwelling. I don't want to get into much detail here, but Howell sure does. Keep in mind that each of these topics receive multiple paragraphs of text. I thought I already knew a fair bit about the marine ecology/biology aspect but was pleasantly surprised at how much I was learning as I read - really a great surprise; one of the best introductions of any bird guide I've read. Anyway, I digress. Back to the intro. After the oceanography, Howell delves into seabird taxonomy, a rather intimidating task! He does a really nice job of turning a potentially confusing situation into something manageable. Tubenose taxonomy has seen some major discoveries in recent years, based on genetics, that have changed what we know about relationships between many taxa. Undoubtedly more discoveries will soon be made, and Howell does not pretend to know all the answers...he is quick to illustrate just how much we DON'T know about the phylogeny of these birds. To conclude this section Howell writes on each tubenose family. Up next is the broad section entitled "Field Identification of Tubenoses." Here the author discusses important topics such as molt, wear, lighting, wind speed, structure vs. plumage, soft parts, etc. Loads of info here. Lastly, he winds up the Intro with short section on finding seabirds and a few pages on conservation (which is only mostly, but not entirely, depressing). Onto the meat and potatoes: the Species Accounts. Each species receives, on average, 2-3 pages of text and a plethora of photos followed by detailed captions, plus a range map. Howell has a knack for packing plenty of info into a small space. His text is succinct and to-the-point, but by no means does he skimp on detail. Headings and sub-headings include the following: a brief ID summary at the start, taxonomy, nomenclature, status & distribution, similar species, habitat & behavior, general description, and molt. The photographs are of high quality, many taken by the author himself, which goes to show just how much time Steve has put into field study of these birds over the past several years. Each photo caption is unique and emphasizes how that particular individual is a typical or atypical representative of the species. There are enough photos to show great variation in most taxa, some with photos taken at different times of year in different oceanic regions, including places far far away from North America. Even so, some photos are of mediocre quality and could use an upgrade, which is probably my only critique of the guide. The guide concludes with a few pages on terminology, extinct species, and hypothetical records. OVERALL this book is a winner. It is difficult to pick out negatives here. I had been looking forward to this one for quite a while, and it lives up to those lofty expectations. 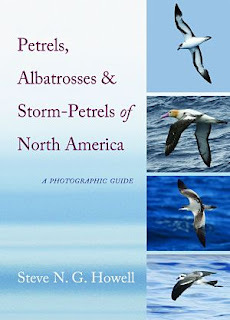 I recommend this guide to seabirders of EVERY level, whether you're a seasoned pelagic veteran or someone who can't yet tell a storm-petrel from a shearwater.